Using the very latest SolidWorks modelling software Dando engineers and designers are able to bring innovative products to the market faster while making cost savings for its customers. This software provides Dando’s design team with the capabilities to create, analyse and optimise product design. The team works in close collaboration with suppliers and co-departments within Dando Drilling creating a systematic network of specialists with a common goal. As a result, increased productivity and high quality of design is achieved. The same software and strategies are further used to improve existing products as part of a continuing development program. With the latest technology at hand, product designs are analysed (theoretically and physically) and verified from the conceptual phase to the end product in order to optimise design. Integrating AR software within the design process enables the designer to create a direct view of the product under analysis in a real-world environment. This allows the designer to literally move around the virtual design and inspect individual elements from authentic visual perspectives. By augmenting the conceptual product, a perception of size and aesthetics can be determined. Design-for-Manufacture methodology is carried out during the design process integrating with suppliers to reduce the prime manufacturing costs of products through implementing cost savings (for existing products) and cost avoidance (for new products). 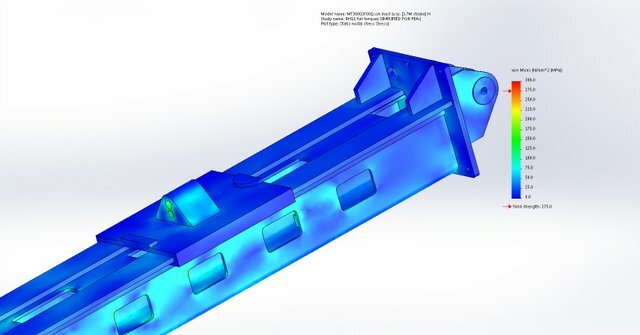 FEA is a computational tool for performing engineering analysis and is vital in understanding the structural behaviour of drilling rig core components such as the mast structure, chassis and sliding carriage unit. Using the latest FEA simulation software and applying fundamental physics, real-world drilling scenarios can be simulated and core components are analysed theoretically. This systematic design revision is a standard procedure at Dando Drilling with the major aim to increase operating life by adopting FEA to drive product design. Note: All drilling scenarios are simulated at maximum possible load i.e. Mast structure stress tests are performed with the sliding carriage at the top of the mast; full torque and full pullback is applied in this instance. With a high regard for health and safety, in-house testing is carried out to verify computational results of FEA, monitor structural behaviour and confirm performance under expected service conditions to assure product reliability. As part of Dando’s verification and testing process, experimental stress analysis has been performed using biaxial stress-strain gauges to test 1st principal strain (tension) at a pre-defined location.